Tomorrow, Palm Sunday, begins Holy Week—the last week of Lent and the week before Easter. I’d like to think that our entire 40-day Lenten Fast has been holy. Holy, Qadosh [in the Hebrew] literally means “to be set apart for a special purpose.” We set apart these 40 days for a special purpose, to draw closer to God. Jesus’ journey to Jerusalem was for a special purpose, to do the will of God. As we begin this last week of Jesus’ earthly ministry, I plan to renew my purpose to draw closer to God and discern God’s will. We have spent 33 days together on this Daniel Fast. I have continued on the path in spite of moments of falling down. Actually, I learned more about myself when I missed the mark, yet kept going. I learned that determination was the key to returning to and continuing my fast until the end of Holy Week. Just as Jesus set his face towards Jerusalem, I, too have a purpose that will keep me going until the end of the Fast. All of us agree that prayer has been a major strength in staying on the Fast. Praying when I get hungry for just anything as long as it is cookies, praying that when I buy groceries that the restricted foods did not “jump” into my cart, and praying that I would not eat some of my favorite foods when I was in New Orleans. Okay, maybe that time, I did not really pray until after I ate the food—but I did pray for strength not to do it again! 😉 Jesus prayed to stay connected to his Source, for strength and power. I prayed for the same during this Lenten Season. My goal was to get further insight and direction by deepening my connection with God, listening to my inner voice, and treating my body as the temple of God by making wise food choices. Tomorrow may begin Holy Week, but throughout these 33 days, we have walked a holy walk. 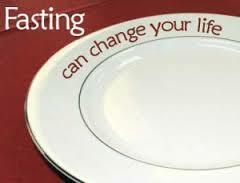 When we offered our food choices to God’s will and took on this spiritual discipline of fasting and praying, we entered into a holy and sacred journey with Jesus—through the power of the Holy Spirit. We become more sensitive to God’s will [His desires, His plans]; we also become more willing to do it. We allow time for deeper spiritual self-examination and re-orientation. During this time we have spent fasting and praying we have opened ourselves to hearing God. As we join together on the final days of Lent, I plan to “set my face,” become more determined to keep going and to listen for God—because this is a holy journey. A journey that ends in a glorious victory. Thanks be to God. Prayer: Holy God, I pray for continued determination to do your will. Amen. Posted on April 12, 2014, in Uncategorized. Bookmark the permalink. 1 Comment.